About 35 years ago, when the skies were darker in the suburbs north of Baltimore I would keenly wait for the large meteorite showers in August and November. I would stay up late and peer through my bedroom window hoping to catch a falling star. They seemed more impressive back then, I could usually count on seeing them if I looked hard enough. To my amazement, and in what could only be considered a coincidence of astronomical proportions, one morning I found a tiny meteorite lying on the garage roof just outside my window. What are the chances that someone actually watching the meteor shower having a small fragment land outside their window. There was no mistaking it. It was a little smaller than the size of a dime, irregular shape, black with and orange crust in a few places. Back then I wasn’t sure what to do. We didn’t have internet, email or any type of instant communication. So I wrote a letter to a university that I had seen in a book while I was doing research on it at the library. I asked how I could tell if it were a real meteorite. They wrote back and said I would have to send them the object. I couldn’t do that, it was a one of a kind. So I tucked it away in a small metal tube for safekeeping. Over the years, somewhere in the accumulated mess of a teenage boy’s world I lost track of it. I’m sure it is still there in my parent’s house somewhere, but wherever that place is, it isn’t obvious. Last weekend while watching part of the marathon of Meteorite Men that ran on The Discovery Science Channel I began to think about my little visitor from space and whatever became of it. Now, there were other grown adults like me who were captivated by rocks falling from the sky, only they spent their adulthood scouring the country looking for the same little pieces of rocks from space that had come right to my rooftop. 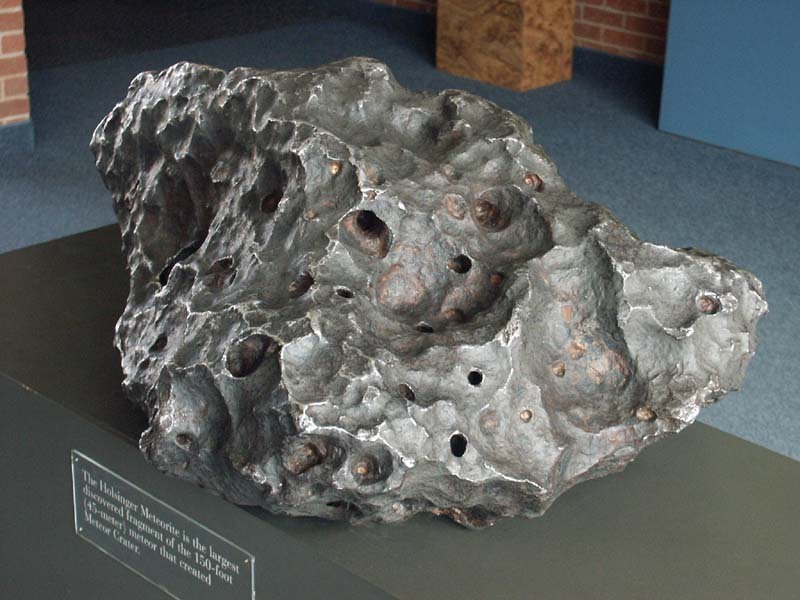 The “Meteorite Men” have done quite well finding space rocks of all types, shapes and sizes. So well, that they’ve made a career out of it. Seeing them unearth buried pieces of rock that date back to the formation of our solar system is quite awe-inspiring when you think about it. Being the first human to touch a rock from space, or see a rock from space is quite the feat. A few years ago, on the 23rd of December, my son had just come into town for the Christmas holidays from his Air Force Tech School training. When he got here we decided to do some very late night shopping to get him caught up. As we were driving back to the house around 1am we saw this ball of fire come out of the sky right in front of us. It was bright and large and it seemed near the city of Charlotte about 15 miles away. As soon as we got back in the house we started searching the internet for news. We were so certain that others had seen it, or that a weather cam picked it up and caught it on film, or that it landed somewhere near Charlotte and someone heard it, but no luck. I emailed local weather people, no response. It could have been miles away or hundreds of miles away, but debris from it is out there somewhere. With no concrete evidence of where it could be, no one will ever know. So I got to thinking about that and did some quick research on meteorite strewn fields in my immediate area. There are a few, and not what I would call immediate to Charlotte, but within North Carolina, but they are old and date back to the 1800’s and they most likely have been picked clean by meteorite hunters over the years or the fragments long eroded by wind and rain. I did find one intriguing sighting in a nearby state that was recent and the object has yet to be found. Just for fun, I’m going to do a little research using the available data and plan a little road trip and try my luck where others have failed. In the sixty minutes that Meteorite Men is on, the task of actually finding a space rock seems easy, but that is just the edited version. They admit that they often search in futility and find nothing. My endeavor will likely end the same way; it’s searching for a needle in a haystack. The thrill of this is not just the search, but getting out and looking. It’s about being creative and inventive and talking to local townspeople about what might have been seen or found. It most likely will be never found, but it is just another space adventure that will happen right here on earth. Perhaps one day my little rock will turn up or maybe I’ll start using my spare time to head west and spend some time in the Arizona and Nevada deserts looking for rocks from space. It doesn’t seem like there can be a much better way to see America and meet interesting people than to find the little towns that were lucky enough to have a visitor from outer space come calling. Your blog is so excellent. I am your regular reader of your blog. I follow your blog. I like your way of posting. I am honored to add it to my blog in right side bar links. Will you add my blog in your blog list.